Since I talk so much about the importance of clean eating, I think it’s only fair to also address “clean beauty” – and how important it is to choose natural products for your hair, skin, and body. I won’t lie: It’s easy to get confused these days. Labels like “natural,” “chemical free,” “noncomedogenic” (the products don’t block pores) or “for sensitive skin” can fool us into thinking we’re buying something safe. But that’s not always the case. According to the Campaign for Safe Cosmetics, about 89 percent of the ingredients in all cosmetics (soaps, lotions, makeup, etc.) haven’t been evaluated by any publicly accountable agency or institution. Yikes! But if you do your homework, it’s not hard to find companies that both use safe ingredients and create products that actually perform well. Luckily, you don’t have to go digging around the Internet to find them, since I already have a few favorites I can strongly recommend. You know that intoxicating aroma you smell when you walk into a beauty spa? Annmarie’s products use aromatherapy to help soothe and uplift your mood while simultaneously beautifying your bod. Her hand-blended line of natural skin oils, scrubs and serums are free of synthetic chemicals or dangerous additives – nothing but nature’s ingredients. Best part? She’s offering a super-special discount to my readers! For a limited time, you can grab one of her sample kits for just $10 – and get FREE shipping to boot! I love that we have so many options these days when it comes to natural beauty products, and these brands definitely pass the tests of quality and safety. Share the good word with your sisters, your gal pals – even your grandma – because every woman has the right to be confident about what’s she’s putting on her skin. Sara Gottfried, M.D. Sara Gottfried, M.D. teaches women how to balance their hormones naturally so they can rock their mission. She is a Harvard-educated physician, speaker and New York Times bestselling author of The Hormone Cure (Simon & Schuster, 2013). She is board-certified in Obstetrics and Gynecology, and is regularly featured in magazines such as Cosmopolitan, Glamour, Redbook, O Magazine, and Yoga Journal, and TV including The Ricki Lake Show and 20/20. 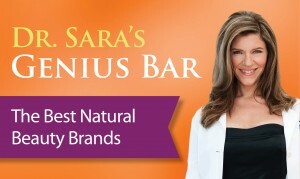 Known for effortlessly blending the seriousness of women’s health with playfulness and humor, Dr. Sara’s mission is to help women lose weight, feel great and vital from their cells to their soul.